We bring you slightly delayed news from the World Economic Forum in Davos, Switzerland. 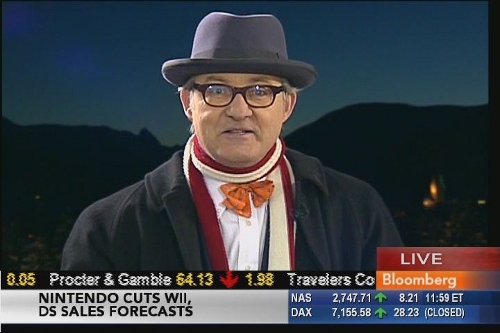 You may have spotted Tom Keene's remarkable hat during his broadcasts out there and wondered, like me, whence it came. Wonder no more, chums. It's from Worth & Worth, the New York-based hatters, who have been providing coverings for the discerning bonce since the 1920s. I've mentioned this before, but Bloomberg offers all the style tips a man could need, none more so than with the traditional styling of Tom Keene - anchor for Surveillance Midday on Bloomberg Television and host of Bloomberg Surveillance on Bloomberg Radio. 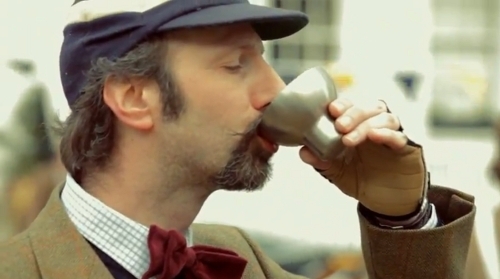 And think about this: while you are marvelling at a particularly fetching bow-tie of his, you're also absorbing useful business information — clever stuff. You can't do that with Fashion TV. Thanks for Enlightening your followers to our hats. Your blog should be followed by every male with a fashion sense! check out our website for many beautiful hand crafted hats. and blog.